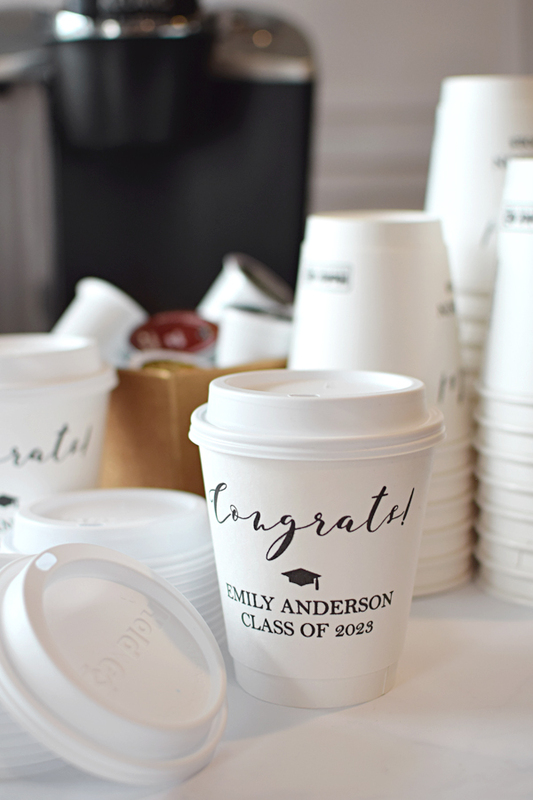 Serve up coffee or hot chocolate at your graduation party in these personalized 12 ounce paper to-go cups which feature a built-in cup sleeve to keep your hands comfortable while your beverage stays nice and hot. Personalize the front of your cups with a fun graduation design and up to three lines of custom text. Each insulated, paper cup will hold up to 12 ounces when full to the brim. Matching lids are included for the perfect take home coffee cup. Cups measure 4 inches high x 3 1/4 inches in diameter. Great to set next to the Keurig or coffee pot.